No, we’re not accepting applications at this time. No, we don’t have any openings. No, we’re not hiring. There’s no chance we’ll be expanding this year. No, we looked over your resume and, no, we can’t offer you a job now. You’ve filled out hundreds of applications. You’ve done your best on interviews and you still don’t have the job you want. Now, with the new book “This is How to Get Your Next Job” by Andrea Kay, you’ll be able to determine your next step. When her husband, a small business owner, said that he had given up hope in finding the qualified employee he’d been looking for, Andrea Kay knew there was trouble. Some of his interviewees seemed unprofessional. Others just didn’t seem like a right fit, which is Kay’s first important point: when job-hunting, you may be passed over because of how employers “feel about you” or because of how you “seemed,” based upon how you acted when applying or interviewing. The good news is, that’s something you can fix. 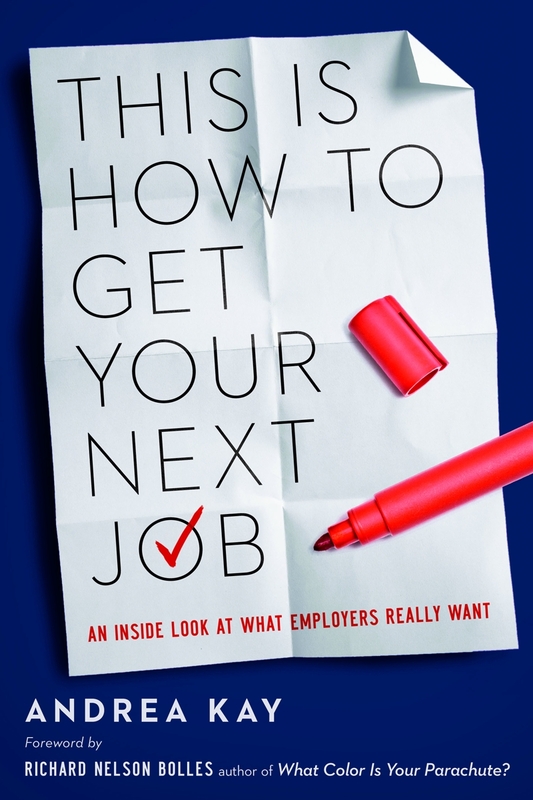 "This is How to Get Your Next Job"
Next, ask yourself how you want to seem to a prospective employer. What are your strengths for this job? How will you fit? How will you show those strengths and convey that meaning clearly, without merely using words? Those are some of the questions you “must, must, must” ask yourself before you go to your next interview, while you’re there, and after it’s over. Then memorize them. Your new job may depend on it. So you think nobody’s hiring? Author Andrea Kay says you’re wrong, and in this helpful book, she shows you what to do to put yourself front-and-center in an employer’s mind and his resume pile. Because it’s filled with dozens of illustrative anecdotes from employers willing to share their experiences, this book is really quite entertaining. I spent lots of time being amazed that people really do the kinds of things Kay mentions, and laughing. These cautionary tales fit well in this book, and nicely prove her “tell and show” advice. This book is great for new grads, the newly unemployed, new career searchers, and anybody who needs a job soon. If that’s you, then “This is How to Get Your Next Job” will help, no doubt.